For my first six months of yoga classes, I used no props–at least what I now know as props. At the Berkeley RSF in the late 1990s, all we had were towels and padded gym mats (which did come in handy for kneeling). Eventually we got mats. But I didn’t try a block until I set foot in an actual yoga studio. In a year or two I began acquiring my own props. 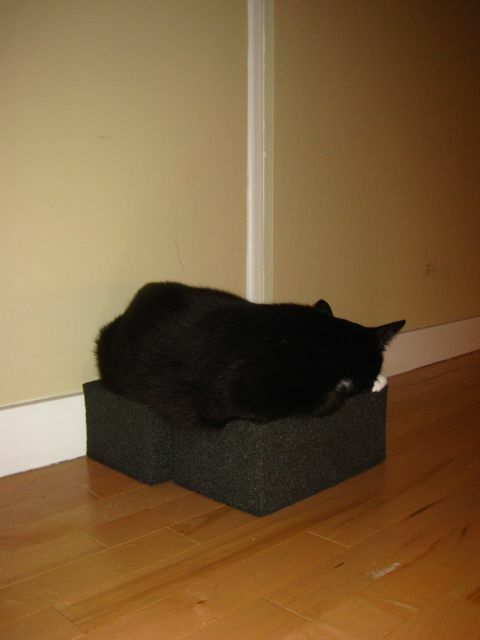 My first foam blocks were the dense, textured ones sold by Yoga Props, a longtime Internet retailer based in San Francisco. (I’ve never seen them sold elsewhere.) In classic black and with an un-scratchable surface, they are more durable than the typical smooth variety. (One block does have a few teeth marks compliments of my late calico Ginger, plus a shiny patch from a too-close encounter with a space heater.) These foam blocks remind me of lava rock and I ended up transporting them to my parents’ home in Hawaii. Those were my only blocks for many years. Finally I decided that I deserve a pair of classic solid wood blocks. Then I discovered that they’re rather hard to find. I ended up buying two alternate types from Halfmoon, a prop maker in Vancouver: cork, which have a secure, non-slip texture, and hollow cedar, which, while no substitute for solid wood, are lightweight and made in Chilliwack, BC. Shortly thereafter, I stumbled upon a great pair of solid cedar blocks, made by my colleague Jason, a professional cabinetmaker. Wood is a natural material, so each block is unique. On the topic of wood blocks, is it me, or are the ones at RIMYI extraordinarily heavy? I went to Pune last August, and I’m still wondering about those 10-pound blocks. 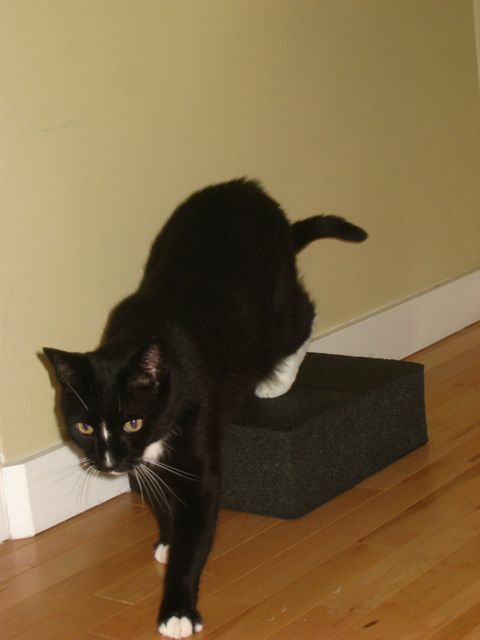 In Vancouver, I discovered flat chip-foam blocks. Did they originate in Canada? I’d never seen them in the USA. Firm and tidy, they’re excellent for sitting poses. While blankets can serve the same function, they become less effective if students fold them sloppily. Also, for Sarvangasana (shoulderstand), a set of four blocks, topped by folded blankets as needed, makes a nice base. Chip-foam blocks are recycled from foam off-cuts, so they’re somewhat eco-friendly. Depending on when purchased, they might be green-multicolor or yellow-multicolor, and firmness can vary. So, if consistency is important, it’s best to buy all you need in one batch. One drawback is that they crumble with wear and tear. Halfmoon sells fabric covers for them, offering a discount for a block-cover combo. The next generation of blocks introduced curved surfaces, to fit the human body more organically. A few years ago, I noticed the Three-Minute Egg at a workshop taught by Aadil Palkhivala; at the time, there was a line of Eggs sponsored by famous teachers, including Aadil’s in teal blue. The Egg website looks corporate, but the company is small and run by a guy named Jason Scholder. I sometimes hear people complain about the cost of props. High-quality props aren’t cheap, but they last forever! I still have my original mat circa 1998 (although I do have five others in my stable); I have yet to discard a mat! My everyday wool blankets also date back 15 years. My block collection is perhaps larger than necessary, but never will I need another, unless I decide to invest in a novel design. If props are essential to Iyengar yoga, and if home practice is likewise essential, why not invest in good props? cool cat! do you know I think I prefer the look of the bhoga blocks, but i’m going to try both in the near future and see which I prefer. 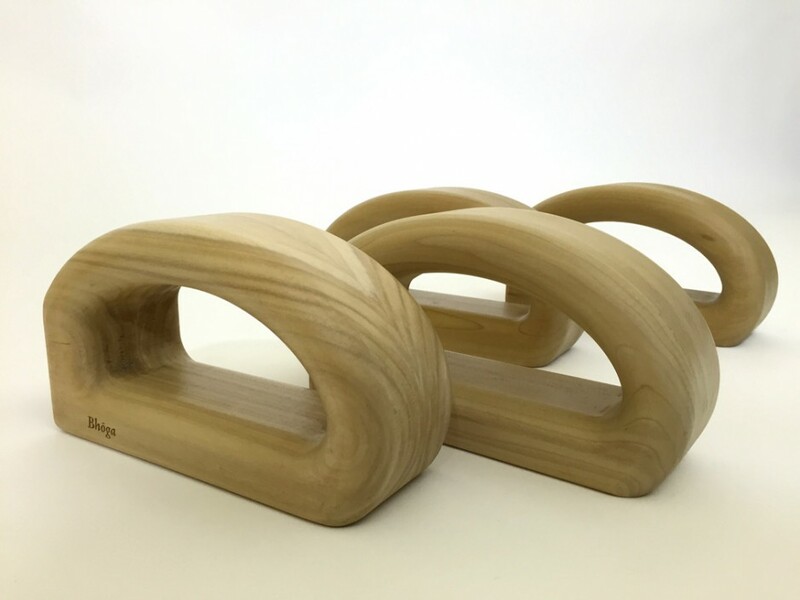 I met the founded of these blocks at the US Iyengar yoga convention in Boca Raton, Florida. In addition to the blocks, he has invented larger props, all beautiful and functional. Next Next post: Yoga protocol: why does it matter?